Having proved herself with 2001's rough and tough Scorpion, Eve changed direction slightly for Eve-Olution. The focus here is less hip-hop and more contemporary R&B, with fewer rappers invited as guests -- they appear on only two tracks, "Hey Y'All" features Snoop Dogg and Nate Dogg and the Scorpion sequel "Double R What" features Jadakiss and Styles. After the intro, Eve focuses squarely on neo-soul, but doesn't contribute much to the style; "What" (with Truth Hurts) and "Gangsta Lovin'" (with Alicia Keys), are surprisingly mediocre, with the guests vamping over bland choruses and Eve contributing only a few good rhymes. Elsewhere, the productions keep the groove going, but not much else: definitely a surprise, considering the beatheads behind the boards (Irv Gotti, Dr. Dre, Swizz Beatz, Poke & Tone) don't get much hotter. ("Irresistible Chick," one of the few keepers, features a smooth Irv Gotti production that's moving almost as fast as Eve's fluid raps.) 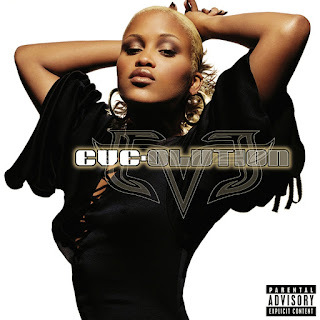 There are a few OK tough-love tracks along the lines of Scorpion's "You Had Me, You Lost Me" and "You Ain't Gettin' None," and a nod to her Ruff Ryders past with "Ryde Away," but Eve-Olution can't offer as much as either of her first two solid LPs.